The Ford Ka is a small car manufactured by the American manufacturer Ford Motor Company from 1996 to 2016, as a city car, and from 2016 onwards as a subcompact car. It entered its second generation in 2008, being produced by Fiat in Tychy, Poland. A third generation was introduced in 2016. The first two generations have a three-door hatchback body style, with the first generation also having a two-door convertible version that was marketed as the StreetKA, alongside a sporty hatch version, known as the SportKA. The third generation is produced as a five-door hatchback and as a four-door sedan. It was initially only available in Brazil, later being introduced in India, Mexico, South Africa (where it is marketed as the Ford Figo), Argentina and Europe. The name Ka has a number of possible pronunciations. For example, with a long or short "a", or with the letters pronounced separately. Ford's press office has used all three. According to Auto Trader, Ford "top brass" have given the correct pronunciation as "'Ka' like 'Cat'." The car was introduced on September 11, 1996 as a small and low-cost addition to the Ford range. It was based on the Mark IV Ford Fiesta platform, but with a completely different exterior design. The design borrowed a lot from Ghia's "Saetta" show car, a roadster designed by Filippo Sapino. The Ka evolved from concept vehicles to production with minor changes. The large, one piece, moulded bumpers and wheel arches made the vehicle more durable and easier to repair. The vehicle was manufactured on the existing Fiesta production line in Almussafes, Valencia, minimising new model investment costs. The Chief Program Engineer was Kevin O’Neill. The designer of the car was Chris Svensson of Sunderland, who had designed a similar-shaped car when at the Royal College of Art in 1992. When the Ka was first introduced to the public it provoked mixed reactions, due to its original and striking New Edge design, overseen by Jack Telnack and executed by Claude Lobo. Besides the styling, the Ka, like its sister cars Fiesta and Puma; was lauded in the motoring press for its handling. Under Richard Parry-Jones' supervision, the suspension and steering settings allowed for hard cornering and high levels of grip, providing strong handling characteristics. At launch, the Ka was produced as a single model, with a number of production options including: air conditioning, power steering, height-adjustable driver's seat, adjustable position rear seat with head restraints, passenger airbag, central locking and power windows. An anti-lock braking system option was added in January 1997. Aside from corrosion, the main drawback was the 1,300 cc OHV four-cylinder Endura-E engine, a design dating to the 1950s Kent engine used in the Ford Anglia. Although not very modern, it provided enough torque to allow relaxed if not spirited driving. In 2002, the Endura-E was replaced by the overhead cam Duratec engine, with claims of improved fuel efficiency and increased refinement, mostly caused by taller gearing on the non-air conditioned models. For the first three years of production, all models had black plastic bumpers to minimise parking damage to paintwork in city environments. These bumpers contained a stabiliser to prevent UV degradation which made them unsuitable for painting because the paint would not adhere properly. However, it became clear that many owners wanted body-coloured bumpers, so they were introduced in 1999 using different bumper mouldings (without the stabiliser). The Ka has proved highly profitable for Ford despite its low selling price, largely due to low development costs. In 2006, Ford sold 17,000 examples of the Ka model per year in the United Kingdom. As with other Ford models, insufficient anti-corrosion treatment during manufacture and the use of non-galvanised steel results in premature surface and structural corrosion becoming established on cars used in more northern, damp climates. In Australia, the Ka was introduced in October 1999 and was on the market there until 2002. It was unsuccessful – fewer than 2,000 were sold per year. This was partly due to the lack of an automatic transmission, which is preferred by a large proportion of Australian car buyers. 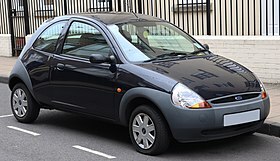 The Ka was also sold in New Zealand between 1999-2004, and was replaced by the newer Fiesta. The Ka has been the best-selling car in its class in the United Kingdom for a number of years and commands around a fifth of the city car market. The UK model range originally consisted of the base version, the Ka, and the higher specification Ka² which standardised a number of the options listed above. The Ka² badge was fitted by dealers. Ka³ was introduced later. Power steering was added to the specification of the basic Ka after the first year. Concurrent with the introduction of body-coloured bumpers Ka² and Ka³ were replaced by Ka Collection and the LuxuryKa (later Ka Luxury). The Luxury version came with a Quickclear heated windscreen, leather seats and interior trim as well as standard air conditioning. A "Ka Blue" special edition was also launched in the UK with dark blue bumpers and a silvery-blue dashboard insert, rather than the standard models' silver. The Ka Sun Collection with a full-length fabric folding roof was also added to the range during the summer months. Unique to the UK was the Ford Ka Van variant, produced exclusively for BT Group and featuring a bespoke flat plywood floor with rubber over-mat and white ply covers instead of rear windows. A further line-up revision gave Ka the following trim levels in the United Kingdom: Studio, Style, Style Climate and Zetec Climate. In 2005, the Sublime model was introduced. This featured special leather interior & features not found on other models. This was only produced in very small numbers and is now one of the most sought after Ka's. SportKa was also added to the range (see below). With the car's impending replacement, in May 2008 a Finale special edition with distinguishing features such as roof decal and black wing mirrors was made available. In 2003, the Ka brand was diversified, with the addition of a new SportKa featuring a sporty body kit, wider track with stiffened suspension and redesigned 16" (40 cm) alloy wheels. Both models came with slightly widened bumpers front and rear with integral fog lamps. A convertible model called StreetKa also appeared, launched with the help of singer Kylie Minogue at the Paris Motor Show. It featured a manually folding soft top or an optional detachable hardtop (on the Winter Edition). StreetKa was a Ford inhouse design built by Pininfarina (the 2000 motor show concept was designed by Ghia, Turin) in Italy and all StreetKas have sill plates inscribed "Pininfarina". Pininfarina produced 37,076 StreetKas between 2002-2005. StreetKa came in two equipment levels, basic and luxury. Basic had cloth seats and air conditioning was an option. Luxury featured leather seats with matching leather door card inserts, heated seats, a Thatcham approved alarm along with Ford's PATS immobiliser, air conditioning and heated door mirrors. Options included upgrading the single CD/radio to an in-dash 6 disc CD/radio and additional rear speakers beneath the roll over bars and a heated windscreen, standard on winter models. All models featured remote control central locking with remote boot release, driver and passenger air bags with passengers air bag deactivation, electric windows and door mirrors, electric headlight aim adjustment, anti-lock brakes, power steering, front fog lights, racing Puma aluminium gear knob, electric hood cover release and a rev counter. The engine used in StreetKa (and SportKa) is called a Duratec but it is of South African origin where it is known as the Zetec Rocam. StreetKa features MacPherson struts front and rear and uses unique wider front lower arms (wishbones) giving it exceptional handling. The only exterior panel shared with Ka is the bonnet. The front headlights are also shared with Ka but appear different due to the front bumper covering them partly to change their shape. The interior shares most parts with Ka except StreetKa has its facia painted blue rather than silver. Its seats are mounted lower than Ka's and it has aluminium effect detailing. In 2005, all Ka models including SportKa and StreetKa received a slightly updated interior, bringing the cabin back up to date, while still retaining the look and feel of the original. Both StreetKa and SportKa received a new 93 hp (69 kW) 1.6-litre 8-valve Duratec petrol engine, whereas Ka, Ka Collection, and LuxuryKa retained the 1.3-litre Duratec petrol engine. The SportKa was noted for its surprising advertising campaign, "The Ka's Evil Twin", denouncing the Ka's traditionally perceived "cute" design. StreetKa ceased to be officially on sale in late 2006. A pink version was produced to promote the new Thunderbirds film, and supplied by Ford to the movie producer. The Thunderbird movie cars were unveiled at the Birmingham Motor Show. Only eight Pink StreetKas were produced by Ford for the film, 5 RHD and 3 LHD. All were signed by Sophia Myles (Miss Lady Penelope). The matching StreetKa dress designed by Bruce Oldfield of Ford was later sold in an auction during London Fashion Week to raise money for Barnados. A Ford KA rally championship was created in 1998. It has proved to be one of the most popular junior rally championships (Ford Ka Rally Cup) in the UK and Ireland. In 2007, Luke Pinder won the BRC Silverstone Tyre 1400 Championship in a Chris Birkbeck Ford KA. Built by the Ford Motorsport (Ford TeamRS) works at Boreham, Essex, The Rally Ka was designed as an entry-level vehicle to compete in a one-make series as part of the British Mintex rally championship. The Ka Championship in 1997 with just four cars in the debut Granite City Rally event. In 1998, fifteen competitors undertook the Mintex challenge. Ford's Boreham airfield facility provides a complete build service for competitors wishing to rally Ka. Most of the parts supplied are concerned with strengthening the car for rallying. Uprated engine mounts and suspension bushes are all included, as is a front strut brace. Aluminium sump and fuel tank guards, OZ Rally wheels and a Safety Devices bolt-in roll cage are all either fitted by the Boreham works or supplied to individual teams. Performance-enhancing modifications are limited to the addition of a Rally spec engine control unit, camshaft and 4-into-2-into-1 extractor set attached to a free-flowing exhaust. This combination lifts power to 80 hp (60 kW), and to cope with it competitors are encouraged to fit the optional uprated drive shafts with larger CV joints. A limited-slip differential and heavier clutch plate are also available. A competition brake package consisting of Mintex pads gripping vented front brake rotors and stronger rear drums is homologated for Rally Ka. Replacing the original shock absorbers is a set of four remote-reservoir Proflex coil-over struts adjustable for compression and rebound damping. These are allied to a lowering kit and adjustable spring platforms to give Ka competitors a wide range of suspension settings including ride height. Inside the Rally Ka is all business. In true rally fashion gone are all but the essentials: the two central eyeball vents are replaced by a tachometer and auxiliary gauge. Even the replacement panels in the dashboard which support the fire extinguisher button and extra switches and gauges required in a rally car are listed in the Boreham parts schedule. A deeply dished rally steering wheel, competition seats and harnesses are all supplied from the kit and replacements are not allowed. In 2008, the European Ka was replaced with a model developed and produced for Ford by Fiat S.p.A in conjunction with Fiat's own 500 vehicle. The car is built in Fiat's Tychy, Poland, factory alongside the Fiat 500, Fiat Panda and Lancia Ypsilon. Despite the wholly different architecture underneath, the new Ka maintains the curved styling features of the original, while bringing the look in line with Ford's Kinetic Design philosophy. It retains the wheel-at-each-corner stance of the previous model. Ford promises a cabin featuring 'expressive colours'. This mostly refers to the multichoice interior styling that is provided for the second time in Ford, right after the success of the Fiesta's interior design. In addition, the interior can be equipped with accessories such as a Bluetooth phone connection, wireless voice control, a USB port, a CD Radio, MP3, an AUX connector, steering wheel audio controls and a speaker system consisting of six speakers, a subwoofer and an amplifier. The new Ka comes with a choice of two engines, a 1.2-litre petrol with 69 PS (51 kW) of power and 102 N⋅m (75 lbf⋅ft) of torque and a 1.3-litre TDCi diesel engine with 75 PS (55 kW; 74 hp) of power and 145 N⋅m (107 lb⋅ft) of torque. Both engines come with sub-120 g/km CO2 emissions (119 for the petrol and 112 for the diesel). Both engines are supplied from Fiat. The main mechanical differentiator between the new Ka and its Fiat sibling is that the Ford has better shock absorption than the Fiat 500. Fitting a rear anti-roll bar enabled 30 percent softer springs and accordingly retuned dampers to improve ride performance over uneven road surfaces. Some of these improvements were subsequently adopted on Fiat 500 Abarth and Fiat 500C models. Changes were also made to the 500's steering geometry for the Ka, although as the new Ka uses an electrically assisted steering system, it lacks the communication of its predecessor's hydraulically assisted steering. However, the electric steering system does make the steering much lighter and more energy efficient than its predecessor. The new Ka has an overall Euro NCAP safety rating of 4 stars, with standard driver and passenger single-stage front airbags, ABS, immobiliser, hazard warning lights and remote central locking (except Studio version in UK). In addition, there are front side airbags and curtain airbags and ESP (Electronic Stability Program) with HBA (Hydraulic Brake Assist) and HLA (Hill Launch Assist) that come at an extra cost. The new Ka made its debut in the 22nd James Bond film Quantum of Solace and was unveiled in October 2008's Paris Motor Show. In 2008, there was some speculation that the Ka might be introduced to the North American market. It has since been confirmed however that Ford consider the Ka too small for American tastes and will not be introducing the vehicle to this market. There are also three "Ford Individual packs" with special characteristics each (in both the interior and exterior design), called Tattoo, Grand Prix and Digital. Tattoo was replaced in 2011 by Metal. All Individual models are based on the Zetec. Developed by Ford Brazil, the Ford Ka Concept was unveiled in Brazil in November 2013. The production version of this new Ford Ka appeared in July 2014, in hatchback and sedan body styles, with the first units arriving in Brazil in September and October 2014 respectively. The next market where it was launched was India, where the sedan made its debut as the new Ford Figo Aspire in August 2015, with the hatchback arriving (as the new Ford Figo) a month later. It was launched in Europe (as the Ka+) in June 2016, with deliveries starting later that year. The '+' in the name shows the fact how Ford sees this as a budget B-segment car (such as the MG 3 or the Dacia Sandero), rather than an A-segment car (like the Volkswagen Up or the Hyundai i10). The new model is based on Ford's global B platform, sharing its underpinnings with the Fiesta supermini, and embodies Ford's Kinetic 2.0 design theme. The hatchback is a five-door only model and it is now 266 mm (10.5 in) longer than the previous model, with the wheelbase increased by 190 mm (7.5 in). The four-door sedan has the same wheelbase as the hatchback, but two length variants: a longer one in Brazil (dubbed Ka+), measuring 4,254 mm (167.5 in), and a shorter one exclusively in India (dubbed Aspire), measuring 3,995 mm (157.3 in). In Brazil, it is offered with a choice of two petrol engines: a 1.0-litre three-cylinder, developing 59 kW (80 PS) and 100 N⋅m (74 lb⋅ft), or a 1.5-litre four-cylinder, developing 77 kW (105 PS) and 143 N⋅m (105 lb⋅ft). In India, the range consists of either a 1.2-litre four-cylinder petrol, developing 65 kW (88 PS) and 112 N⋅m (83 lb⋅ft), a 1.5-litre four-cylinder diesel, developing 74 kW (100 PS) and 215 N⋅m (159 lb⋅ft), or a 1.5-litre four-cylinder petrol, developing 82 kW (112 PS) and 136 N⋅m (100 lb⋅ft). The latter is paired with Ford's six-speed automatic PowerShift transmission, while for the rest a five-speed manual option is available. In Europe, the Ka+ comes with only one engine, a 1.2-litre unit, that comes with either 51 kW (70 PS), in the Studio or the Zetec trim levels, or 63 kW (85 PS), exclusively in the Zetec model. It features equipment such as the Ford's MyKey, MyDock and SYNC systems, steering mounted controls, automatic climate control, power-fold mirrors, keyless entry, electronic stability control, cruise control (in Europe), up to six airbags and high-strength steel body structure. In November 2015, a Ka+ model with two standard front airbags and standard ABS with EBD was tested by Latin NCAP and was awarded four stars out of five. It was considered that in the frontal impact the driver's head and chest received adequate protection, the passenger's head and chest received good protection, while the driver's and passenger's knee areas received marginal protection. The bodyshell was rated as stable and was capable of withstanding further loading. In March 2017, Euro NCAP released the results of the tests performed on the Ka+ and it scored three out of five stars. For the adult occupants it received a 73% rating, for the child occupant a 61% rating, for the pedestrian occupant a 57% rating and for the safety assist category a 29% rating. The car's performance in the tests was rated as "mediocre", being criticized for lacking rear seatbelt pretensioners and load-limiters, poor chest protection in the full-width frontal crash test and the lack of autonomous braking technology. It was subsequently launched in Mexico in September 2015, and in South Africa one month later. In March 2016, it was also introduced in Argentina. The new Ka is produced at Ford's factories in Camaçari, Brazil (from where it is exported to Argentina) and in Sanand, Gujarat, India (from where it is exported to Mexico, South Africa and Europe). Over the years the Latin American Ka has become progressively different from the European Ka. The first divergence was in 2003, when the rear of the Latin American made Ka was significantly re-designed. This was followed by a more complete divergence from the European Ka in 2007, when the Latin American made Ka was relaunched with a completely new body over the original platform. With the launch of the second generation European Ka, with a new body and the new Fiat platform, the separation of the European and Latin American Kas was complete. They are now completely different cars. From the year 2000 to the present, the Latin American Ka has been powered by either a 94 hp (70 kW; 95 PS) Zetec Rocam 1.6-litre petrol engine or a 64 hp (48 kW; 65 PS) Zetec Rocam 1.0-litre petrol engine. Both are four-cylinder units. A total of 63,766 units were sold in Brazil in 2011, making it the 14th most sold car in Brazil that year. From the 1997 launch, and until 2001, the Latin American Ka was substantially similar to the European Ka, differing only in levels of equipment and trim. The main differences from the European model were the very short gearing for the manual gearbox (the only transmission available) and the lack of soundproofing, which had been gradually removed annually since 2000 as a way to cut down costs, following the practice of other Brazilian car makers at the time. In 2001, the Latin American Ka received a facelift which left it slightly different, externally, to the European model. The most noticeable difference was at the rear, where the number plate was moved from the bumper to the boot (trunk) lid, and the rear lights were made much taller. Ford presented the new Brazilian Ka on December 14, 2007. Sales started in Brazil on January 2, 2008. The car was exported to other markets in Latin America. In comparison to the original Ka, this model has a longer rear overhang and a redesigned rear seat to accommodate a fifth passenger. With a length of 3835 mmm, it now fits in the subcompact car class. In 2011, Ford presented a facelifted version following the Kinect concept car. In Brazil, only the Sport version offers a 1.6-litre engine. In 2008, with the launch of the new European Ka based on the Fiat platform, the two lines of the Ka finally became completely separate. The new Ford Ka was introduced in the 2014 São Paulo Motor Show, becoming available on the market in August of that year and presented at the 2015 Buenos Aires Motor Show. The Ford Ka adopts the "Kinetic" design, presenting a more aggressive style and it is slightly bigger than the previous model, adopting a 5-door body, occupying the site of the former Ford Ka and Ford Fiesta One. Also adds a new body variant 4-door sedan, called Ka+. The new Ford Ka offers two engines: a 1.0-liter, in-line 3-cylinder, 12-valve with TiVCT technology (producing up to 85 advertised HP) and the 1.5-liter in-line 4-cylinder 16-valve featured in the more basic versions of the Fiesta (producing up to 110 advertised HP); gearbox options are limited to the well known 5-speed IB5+ for both the 1000cc and the 1500cc variants. According to local press, the current 1.0 L version of the new 2014 Ka is the most economical compact car without a turbocharged engine (which title would be help by the VW up! 1.0 L TSI), achieving up to 12 kilometres inside the city of São Paulo with only one litre of E100 (ethanol fuel). E33 fuel (Brazilian standard gasoline spec) economy facts have not been publicized as of yet, although owners claim it does about 1 km/L to 2.5 km/L more than with E100. Its Sigma 1.5 L-equipped version has been well received by the Brazilian market due to its relatively vigorous launches and good torque in low and mid-range revs. In January 2008, it was announced that the new Brazilian Ka would not be offered in the Mexican market. This meant it was officially discontinued. In 2015, Brazilian Ka third generation was introduced as Ford Figo. In 2006, two commercials advertising the Ford SportKa in the UK proved controversial when they received complaints for their content. The first commercial included a parked SportKa as a pigeon flies toward it, presumably to befoul it. When the pigeon is within range the SportKa violently pops its hood, bashing the bird to its death. The second advertisement saw the SportKa opening its sunroof as if enticing a nearby cat to peer in. When the cat climbed on the roof and peeked inside, the sunroof closed and beheaded the cat. Both commercials concluded with the graphic, "Ford SportKa. The Ka's evil twin." After many complaints, these advertisements were removed from air and not shown again. ^ a b "Production begins of the new Ford Ka". Ford. September 25, 2008. Archived from the original on September 28, 2008. Retrieved February 7, 2009. ^ Kittler, Eberhard (2001). Deutsche Autos seit 1990, vol.6. Stuttgart: Motorbuch Verlag. pp. 10–12. ISBN 3-613-02052-1. ^ Automobile Revue, catalogue edition 2005, p. 232-33. ^ Love, Martin (May 10, 2009). "So near, so Ka". The Observer. Retrieved July 9, 2013. ^ Pattni, Vijay (April 2, 2008). "Car names – the unpronounceables". Auto Trader. Archived from the original on May 31, 2010. ^ a b "Streetka Overview". Ford Motor Company. Archived from the original on June 15, 2013. Retrieved May 15, 2013. Major sheet metal stampings are provided by Ford’s Valencia Assembly Plant – home of the Ka. ^ "Ford Automotive Operations – Latin America (Brazil)". Ford Motor Company Newsroom. Archived from the original on June 17, 2001. Retrieved May 15, 2013. A Brazilian-built Fiesta was launched in 1996 and the Ka and Courier pickup arrived in 1997. ^ "Future Retro: Ford Ka". Dep-O Magazine. Archived from the original on March 31, 2010. ^ "Ford Ka Retrospective". Channel 4. ^ "Ford Ka – Car Info". Fordka.info. Archived from the original on July 6, 2008. Retrieved October 19, 2008. ^ Street, Mike. "BT Fleet: The Ford Fiesta and Ka Vans". Light-Straw. Retrieved March 20, 2015. ^ "Street Ka Kylie Release". Media.ford.com. March 27, 2002. Archived from the original on July 16, 2012. Retrieved February 17, 2012. ^ "WORD ON THE STREETKA". The Star. February 2, 2014. Retrieved February 2, 2014. ^ "Used car buying guide: Ford StreetKa (2003–2006)". Autocar. July 10, 2013. Retrieved February 2, 2014. ^ "Ford StreetKa Luxury". Auto Express. August 18, 2004. Retrieved October 5, 2010. ^ "2004 Ford Thunderbirds – Backstage at Birmingham Motor Show". Seriouswheels.com. Retrieved October 5, 2010. ^ "Ford StreetKa Dress". Seriouswheels.com. Archived from the original on February 10, 2010. Retrieved October 5, 2010. ^ "The original Irish rallying website". Irish-rallying.com. Archived from the original on March 15, 2009. Retrieved May 4, 2009. ^ "Ford KA Rally Car at Melbourne Motor Show". Autoweb.com.au. March 1, 1999. Archived from the original on May 8, 2008. Retrieved February 22, 2009. ^ "All-New Ford Ka Is Late for Its European Debut, Current Model Dies in April 2016". Autoevolution. January 31, 2016. Retrieved April 25, 2016. ^ "Ford Rolls Out Fiat Based New Ka". Auto Trends. September 30, 2008. Archived from the original on September 30, 2008. Retrieved September 29, 2008. ^ "Ford And Fiat Sign Agreement On New Generation Of Small Cars". Media.ford.com. November 7, 2005. Archived from the original on October 5, 2012. Retrieved July 3, 2010. ^ "Ford Ka/Fiat 500 collaboration confirmed". Leftlanenews.com. Retrieved July 3, 2010. ^ "New Model – 500 Abarth 1.4 16V Turbo T-Jet (135bhp)". July 8, 2008. ^ "Ford Ka (2008 onwards)". MSN. November 1, 2008. Retrieved May 4, 2009. ^ "Ford Ka". Euro NCAP. Retrieved May 4, 2009. ^ "Mulally says Ford Ka May Come to U.S". Blogs.automobilemag.com. Retrieved October 5, 2010. ^ "Mulally: Ford Ka and new Ford Ranger not coming to U.S". Egmcartech.com. November 9, 2009. Retrieved October 5, 2010. ^ "Ford KA Custom Modifications – Ford Individual Styling – Ford UK". Ford.co.uk. Archived from the original on June 28, 2010. Retrieved July 3, 2010. ^ a b c d e "Ford preps new Ka for Europe". Automotive News Europe. July 29, 2016. Retrieved March 29, 2016. ^ "Ford Unveils All-New Global Small Car Concept in Brazil". Ford Media Center. November 13, 2013. Archived from the original on March 26, 2016. Retrieved March 29, 2016. ^ "All-New Ford Ka Makes First Public Appearances". @Ford Online. July 22, 2014. Retrieved March 29, 2016. ^ "New Ford Ka aka Figo hatch launched in Brasil; India launch in 2015". IndiaCarNews. August 23, 2014. Retrieved March 29, 2016. ^ "Ford Figo Aspire Launched; Prices Begin at 4.89 Lakh". CarAndBike. August 12, 2015. Retrieved March 29, 2016. ^ "New Ford Figo Launched in India; Prices Start at 4.29 Lakh". CarAndBike.com. September 23, 2015. Retrieved March 29, 2016. ^ "Big Value in a Small Package: All-New Ford KA+ Offers Outstanding Space, Economy and Driving Fun". Ford Media Center. June 8, 2016. Retrieved June 11, 2016. ^ "New Ford Ka concept surfaces". BBC TopGear Magazine India. November 13, 2013. Retrieved March 30, 2016. ^ a b "Novo Ford Ka 2015" (in Portuguese). Anuncicar BH. October 17, 2014. Retrieved March 29, 2016. ^ "Novo Ford Ka+ 2015" (in Portuguese). Anuncicar BH. October 17, 2014. Retrieved March 29, 2016. ^ "Ford Aspire" (PDF). Ford India. February 17, 2016. Archived from the original (PDF) on October 14, 2015. Retrieved March 30, 2016. ^ "2015 Ford Figo 1.5 Titanium AT road test review". Overdrive. November 4, 2015. Retrieved March 29, 2016. ^ "Ford Ka + 2 Airbag" (PDF). Latin NCAP. November 11, 2015. Retrieved March 29, 2016. ^ "Ford Figo 2016 llega a México desde $165,000 pesos" (in Spanish). Autocosmos.com. September 28, 2015. Retrieved March 30, 2016. ^ "All-new Ford Figo lands in SA". IOL. October 8, 2015. Retrieved March 30, 2016. ^ a b "Nuevo Ford Ka, lanzamiento en Argentina desde $ 208.700" (in Spanish). 16 Valvulas. March 6, 2016. Retrieved March 30, 2016. ^ "Carros mais vendidos no Brasil em 2011". Archived from the original on February 4, 2013. Retrieved March 15, 2012. ^ "Home vehículos". Ford.com.mx. Retrieved May 4, 2009. ^ "Top 5 banned TV adverts". Metro. Retrieved September 16, 2013. ^ "City diary". The Guardian. Retrieved September 16, 2013. Wikimedia Commons has media related to Ford Ka.